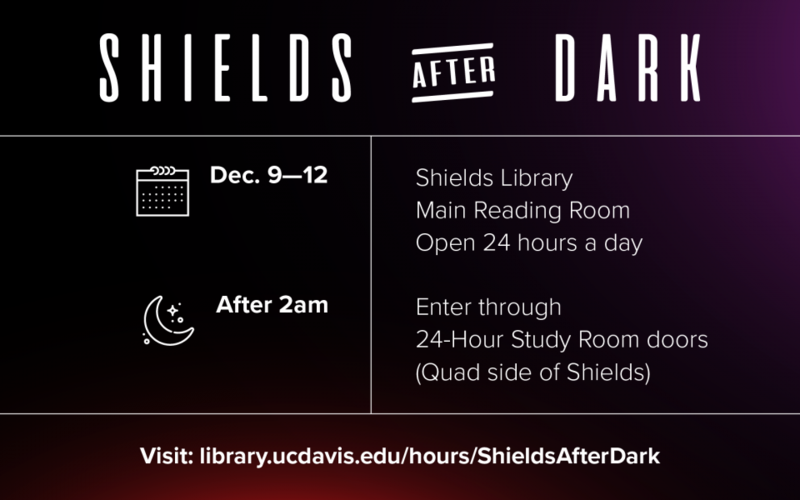 Finals are next week, which means CoHo@Shields and our extended hours are back! Coffee, tea, fresh fruit, baked goods and snacks will be available for you to purchase and enjoy while you study! The CoHo table will be located inside the lobby of Shields. In addition to the 24-Hour Study Room, the Main Reading Room will be open 24 hours starting Sunday December 9th. After 2am, students must enter through the 24-Hour Study Room entrance (facing the MU) with their Aggie card. Click here to see a map of the areas that will be open 24/7. Refer to the calendar below or view the full list of the library’s hours during finals.